Ben Carson knows more than most people do about human brains. The retired neurosurgeon spent his first day at the Republican National Convention in an awkward endorsement cycle in which he tried to convince people that he understood what was inside the head of presumptive GOP nominee Donald J. Trump. He and his small entourage started off at a breakfast meeting with delegates from Georgia. Later, he talked at an awards luncheon of the Latino Leaders Network, where the former presidential candidate turned Trump surrogate was received like a celebrity. Women hugged him. Men lined up to shake his hand. Everyone seemed to want a photo, and he obliged. In between, there was a series of media interviews: in a hotel suite, and then with several of the radio stations among the vast array of temporary studios erected in a parking garage across the street from the Quicken Loans Arena in downtown Cleveland, where the convention is being held. Through it all, Carson’s mission was the same: making the case for Trump. In talking to the Latino business leaders, he said that people’s brains, not their race or ethnic backgrounds, make them who they are. 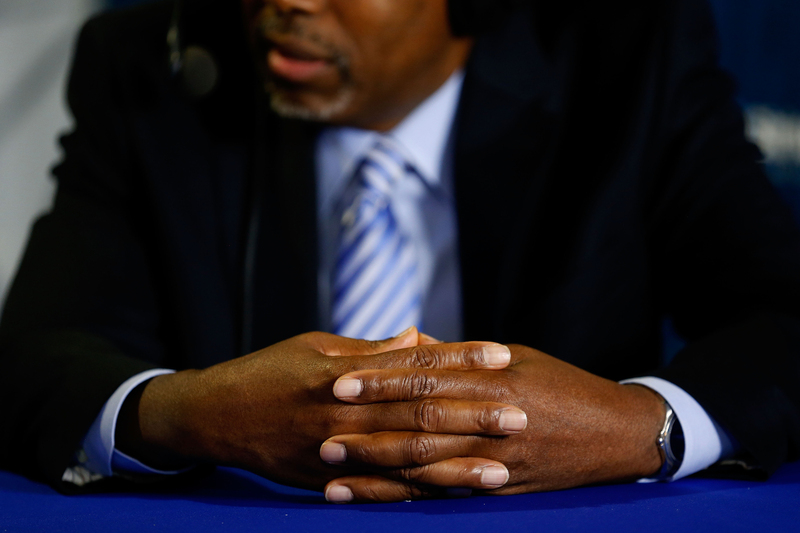 “That’s why I don’t make a big deal out of people’s ethnicity,” Carson said. Carson said Trump could win over a meaningful share of black voters if he allows them to see the man Carson says he has gotten to know. On the surface, Trump and Carson could not be more dissimilar. Trump grew up rich, Carson was poor. Trump is a bully, Carson is gentle. Trump is loud, and Carson is soft-spoken. But, Carson insisted, the two are in sync. Dr. Ben Carson talks with Armstrong Williams during a taping of the Armstrong Williams Show on SiriusXM at Quicken Loans Arena on July 18, 2016 in Cleveland, Ohio. Carson acknowledged that his support of Trump was a “very pragmatic” decision. Of the Republicans left in the presidential race several months ago, he believed Trump was the only one who offered the chance of a GOP victory in November. Texas Sen. Ted Cruz was too conservative. And Ohio Gov. John Kasich’s only path to the nomination involved a brokered convention that would have fractured the party, Carson believed. But since then, Carson said, he has grown to support Trump on the merits. He and Trump have spoken at length about issues crucial to many African-Americans. Criminal justice reform, mass incarceration, job creation targeted at depressed communities and funded by corporate profits brought home from overseas, and reforming education by expanding the use of school vouchers are all issues that are important to Trump, he said. Neither has Trump publicly expressed concern about most of those other issues. As the nation has been rocked by the killing of black men by police and ambushes of police officers by black gunmen, Trump has taken to calling himself the “law and order” candidate. But Carson said he expects Trump to eventually broaden his message. He said he has talked with Trump about plans to encourage business investment in poor communities, and to host a summit to create an agenda to help struggling neighborhoods. Recent ABC News/Washington Post polls found just 6 percent of black voters support Trump, and a recent Wall Street Journal/NBC/Marist poll found that he had zero support among black voters in a series of key swing states. Carson is confident those numbers will increase after the convention, when he will be among those traveling the country to deliver Trump’s message. Carson said he had completed work on a six- or seven-minute speech he will deliver at the convention Tuesday night in which he plans to talk about a nation at risk of sharp decline unless it re-embraces the values that made it great: self-reliance, faith and hard work. Trump is for all of that, he said. Despite his support of the candidate, Carson said he doesn’t want to be part of a Trump administration, nor does he foresee any future campaigns for elective office. He said his career as a political candidate ended when he dropped out of the Republican presidential nominating contest in March. It is a message Carson repeated most of the day. During his luncheon remarks, he talked about the need for America to develop all of its talent regardless of ethnicity — something he says Trump is for even if the candidate does not always say it. Carson talked about one of his best friends at Yale, a brilliant Latino student who had risen from poverty by dint of hard work and perseverance. He said that was one of many Latino friends that he has had since his hardscrabble childhood in Detroit. Everyone laughed. And soon he and his crew were off to the next appointment, the expert on brains trying to change minds.